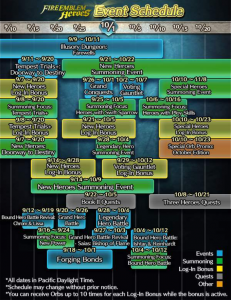 Heroes: New Event Calendar for September and October! Heroes certainly has an exciting month for us ahead! In addition to the recently-released Doorway to Destiny banner, we’ll also be getting two more New Heroes banners this month! Furthermore, a new Legendary Hero will be arriving on 28 September, and a new batch of Special Heroes in early October. In addition to new heroes, Heroes is also planning lots of events. We’ll have a new GHB and Forging Bonds event after the next New Heroes banner. We’ve also got loads of Revival events, recurring events like Grand Conquests and the Voting Gauntlet, lots of banners, and more! Check out the full details below. Interestingly enough, there is no further Tap Battle scheduled after the current Illusory Dungeon: Farewells. Perhaps the name may be an allusion to this being our final Tap Battle, or even just taking a break? 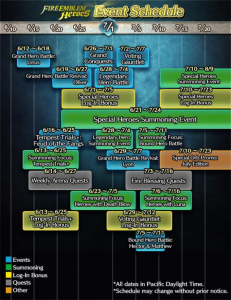 Heroes: Festival in Hoshido Banner & Aug/Sept Event Calendar! Four new Special Heroes are waltzing their way into Fire Emblem Heroes! 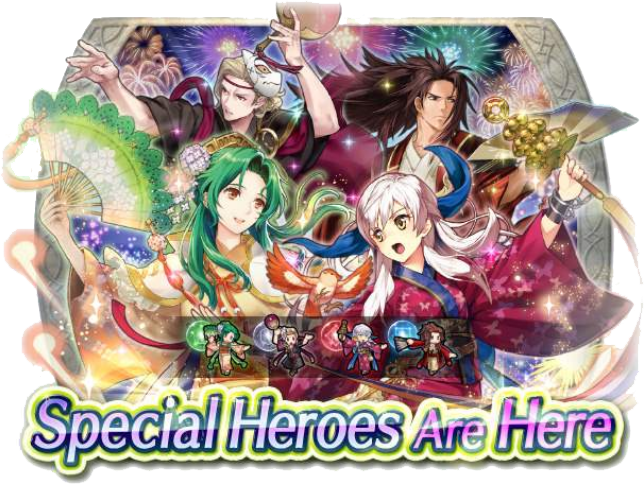 The Festival in Hoshido Banner is now available, bringing four festival-themed 5★ alts: Micaiah, Ryoma, Elincia, and Xander. Check out our earlier article for their skills and details. A new paralogue, also titled Festival in Hoshido, is also now available! Complete all three chapters on all difficulties for nine Orbs. You can also earn an additional three Orbs with special quests! You can see full quest details below. We’ll also get 13 more Orbs with the latest Log-In Bonus. If that’s not enough Orbs for you, the August Special Orb Promo also starts today! This version of the promo contains 21 Orbs and also 60 Sacred Coins. The Festival in Hoshido Banner will be around for about a month, ending on 9 September. The August Orb Promo will be around a bit less than that, ending on 23 August. 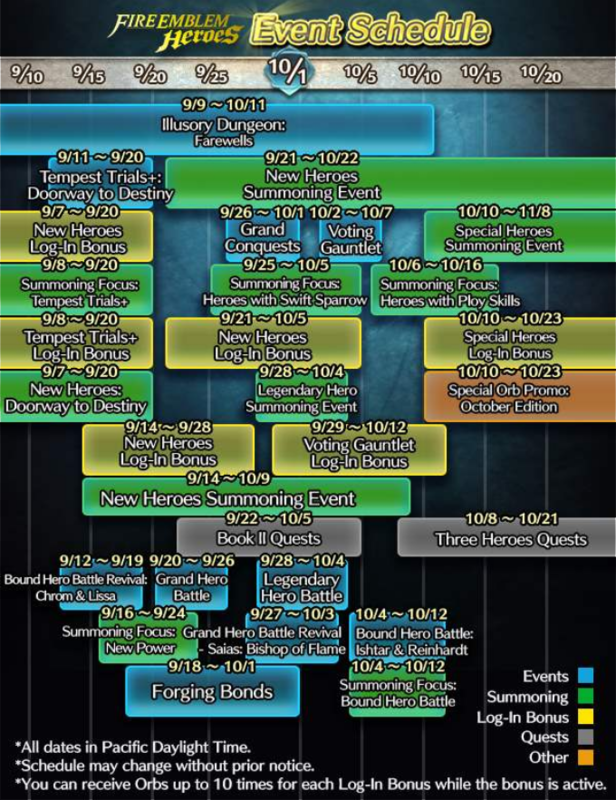 The next month in Heroes will be bringing quite a lot of new content! 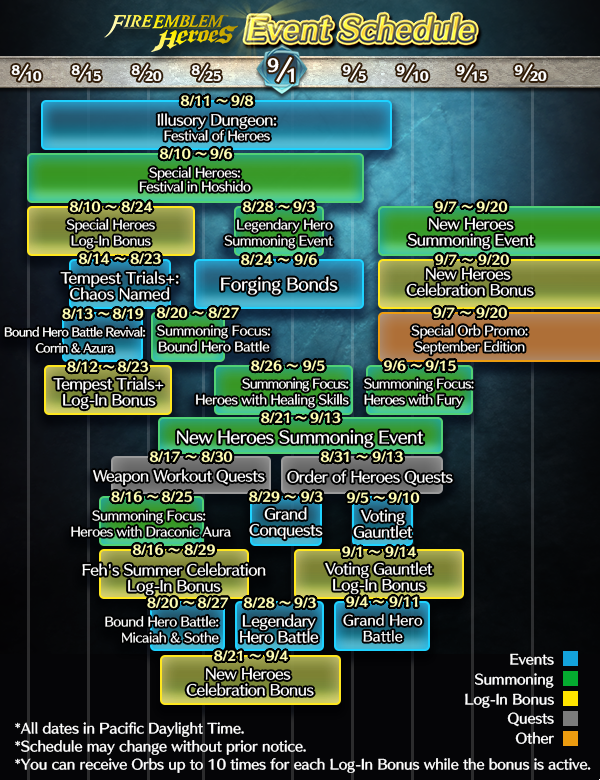 We have two batches of New Heroes coming up, one starting on 21 August and another on 7 September, and also the next Legendary Hero banner on the 28th. 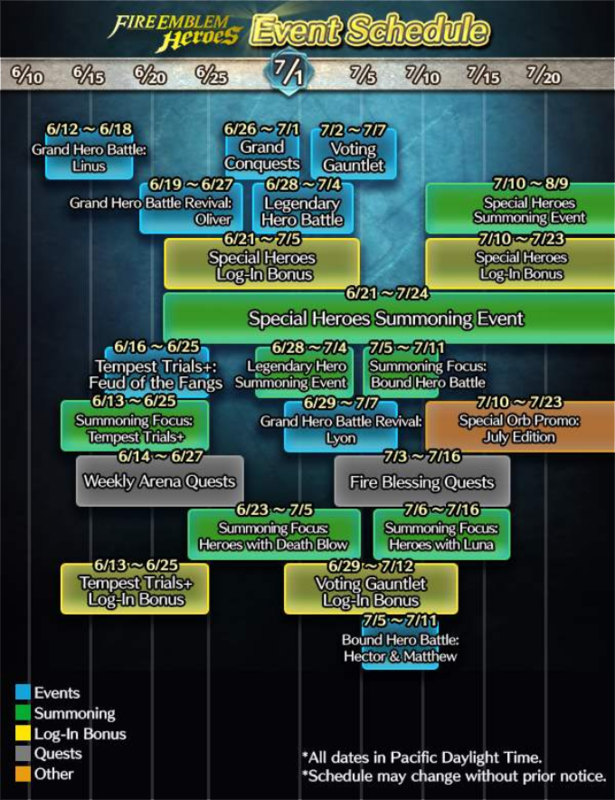 Other events include the Feh’s Celebration Tempest Trials+, the second Forging Bonds, and the next iterations of many other Heroes events: New and Revival BHBs, Voting Gauntlet, Grand Conquests, and Tap Battle. We’ll also get new quests, other focus banners, and lots of goodies. A full chronological text breakdown can be found below. As a reminder, Feh’s Summer Celebration is going strong! Today’s daily banner is Heroes with Death Blow, containing 5★ focus units for Effie, Hawkeye, and Klein. The next feature of the Celebration, a special edition of Tempest Trials+, will be starting early next week on 14 August. The final Log-In Bonus starts on the 16th. 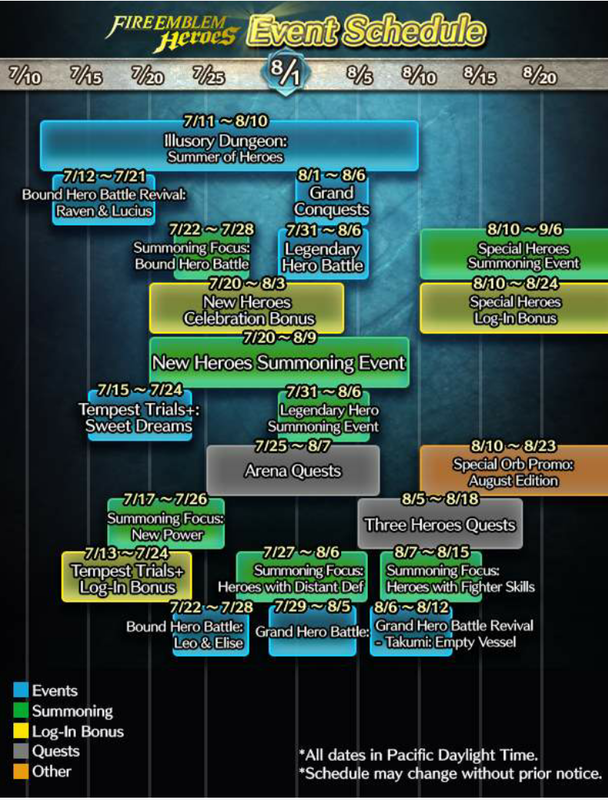 Heroes: June & July Event Calendar + New Tap Battle! 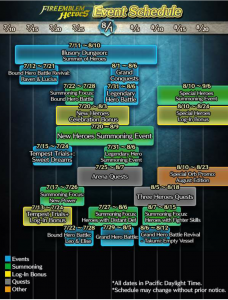 The calendar gives us dates for many new upcoming banners and events. Most notably, a new Tempest Trials+ will be starting up this Saturday, followed immediately by Grand Conquests and Voting Gauntlet. 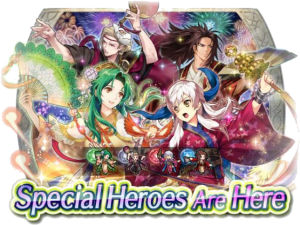 We’ll also be getting new Special Heroes on 21 June and again on 10 July! You can also see a text breakdown of all events below. Additionally, the newest Tap Battle also starts today! Check out Tap Battle: Illusory Dungeon – Legendary Heroes in the Events menu. Aside from playing the various levels, Daily Quests are also starting up today. Another series of quests will be available starting on 14 June. This Legendary Heroes Tap Battle will be available a full month, ending on 11 July. Both sets of quests will end on 25 June.